The Samsung Galaxy S8 is in my opinion one of the most beautiful looking smartphones to date. I think that the two main things that makes the phone look so attractive is due to its edge-to-edge display and overall rounded design. Both the corners of the phone, the screen and the edges are beautifully rounded and curves. You can compare it to the LG G5 and Xiaomi Mi Mix, and you can still see that the S8 has its own distinctive visual appeal. Some people don't like having a 3D curved display and prefer the flat G6 one, but functionality and usability aside, you can't deny that it's one of the best looking phones out there right now. There are also a wide variety of colors to choose from. I also liked that the front color is black, because the cameras and sensors are beautifully blends into the body and less visible. The Galaxy S8 also has a very wide display (measured horizontally). It uses a 18.5:9 screen aspect ratio, making the phone taller. 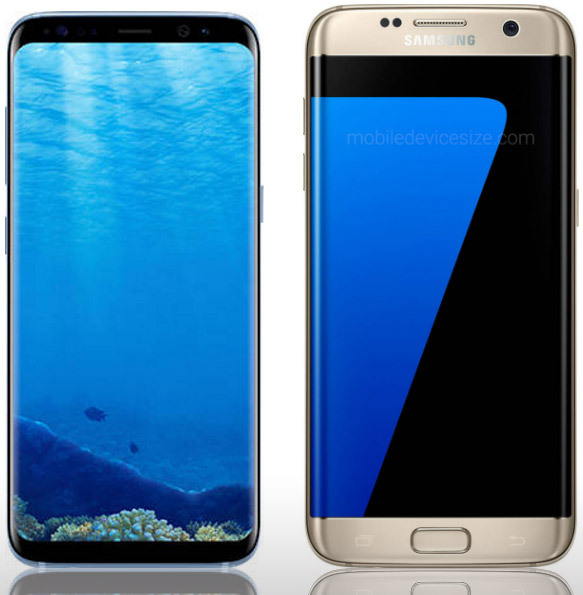 The S8 has 5.8-inch display compared to the S7 edge's 5.7-inch, yet it's smaller in size. It's 5.4mm narrower and 2mm shorter. I remember how excited I was when I first saw and used the Galaxy S7 when it was announced in Barcelona. I was in Barcelona on a vacation the time it was announced. Nobody will argue that it was the best looking phone at that time, and in my opinion it still is. Samsung got rid of the home button and the top and bottom bezels are much smaller now. The screen stretches less horizontally compared to the S7, but Samsung did it in purpose to prevent accidental interaction with the UI when holding the phone.It still looks amazing and the side bezels are really slim, so no problem there, it still look stunning. Even the back has gone some polish compared to the S7. The camera's housing border is much narrower now and the sides are more curved and seamlessly connect the front and the back, compared to the S7, which its back looks separated from the front. The only thing that I didn't like is the fingerprint sensor size and placement, but other than that it looks perfect in my opinion.